Kyocera's PDF Direct Print software utility allows users to send PDF (Portable Document Format) files directly to a printer without the need to open the file in Adobe Acrobat or Acrobat Reader and print using a conventional print driver. Just “drag & drop” or “right click” the file. No print drivers is required and there is no need to open the PDF viewer. Detailed mode is also available for advanced printing such as 2 in 1, duplexing, and finishing. Since PDF files can be encrypted, confidentiality of the document is protected on the network when you print. Encrypted PDFs with passwords will require the correct passwrod entered in PDF Direct Print. 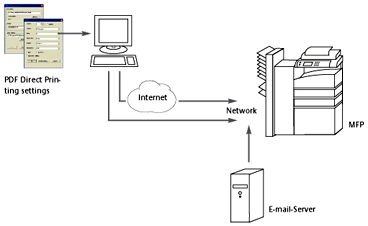 With the Kyocera's Enhanced Network Interface e-mail print function, e-mail PDF attachments can be printed quickly. Documents are conveniently delivered to remote print locations. PDF files scanned and created at Kyocera MFPs can be delivered via e-mail and printed remotely. Stored documents can be easily output with advanced printing options such as finishing and duplexing, just by adding the supported icon to the PaperPort task bar.